Steven Craggs, also known as Steven Leach, was charged with three burglaries spanning Wisbech, King’s Lynn and Cambridge. On November 29 last year the occupants of a house in Murrow Bank, Murrow, returned home from work to find their white BMW 640D missing from the driveway. The couple then entered their home to find it had been broken into and a safe had gone from their bedroom, containing possessions worth tens of thousands of pounds. A few weeks later on January 28, Craggs smashed his way through a French window at a house in Mill Road, King’s Lynn, making off with games consoles, electronics and jewellery worth more than £4,500, but left behind two red marks on walls. On February 11, late at night, Craggs smashed his way through a window at a house in Ramper Road, Swavesey, ransacking the master bedroom and filling a pillowcase with jewellery. Again, drops of blood were found at the scene which came back as a match for Craggs. Craggs, of no fixed abode, was arrested on February 16 and recalled to prison after having been released at the end of August last year. He was charged with three counts of burglary and theft. 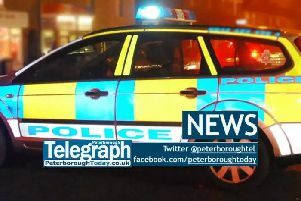 On Thursday (April 4) he appeared at Peterborough Crown Court and was sentenced to four years in prison.